Vasco Núñez de Balboa (1475–January 15, 1519) was a Spanish explorer, colonial governor, and Conquistador. He is known principally for having crossed the Isthmus of Panama to the Pacific Ocean in 1513, becoming the first European to lead an expedition to see and then reach the Pacific coastline of the New World. Balboa traveled to the New World in 1500 and after some early explorations settled on the island of Hispaniola. He founded the settlement of Santa María la Antigua del Darién in present-day Panama in 1510, which was the first permanent European settlement on the mainland of the Americas. Spanish conquest and colonization of most of Central and South America would follow in the decades ahead. Balboa participated, to a lesser degree than other Spanish Conquistadors, in the subjugation of native peoples and expropriation their of resources. Many of the cultures encountered by the Spanish practiced mass human sacrifice, institutional slavery, and other behaviors that Spanish sensibilities found intolerable. Still, the great cruelty employed and the indiscriminate destruction of indigenous culture by the Spanish have come to be seen as grave acts of cultural and political imperialism. The conquests of Spanish America and introduction of the Christian faith can be set in the context of the broad movement inaugurated during the Age of Exploration in which new formerly unknown lands and peoples came to be included in great European empires. The period can be viewed as part of a process that would lead in time to their dismantling and to the emergence of the modern world where sovereign nations recognize their interdependence within a new global consciousness. Vasco Balboa was born in Jerez de los Caballeros in Spain. He was a descendant of the lords of the castle of Balboa, near Villafranca de los Barros, in Badajoz; his father was the hidalgo (nobleman) Nuño Arias de Balboa, and his mother was a lady of Badajoz, which is located in southwestern Spain. Nothing much is known of his early childhood except that he was the third of four boys in his family. During his adolescence, he served as a page and squire to Don Pedro de Portocarrero, lord of Moguer. In 1500, motivated by his master after the news of Christopher Columbus' voyages to the New World became known, he decided to embark on his first voyage to the Americas, along with Juan de la Cosa, on Rodrigo de Bastidas' expedition. Bastidas had a license to bring back treasure for the king and queen, while keeping four-fifths for himself, under a policy known as the Quinto Real, or "royal fifth." In 1501, Balboa crossed the Caribbean coasts from the east of Panama, along the Colombian coast, through the Gulf of Urabá toward Cabo de La Vela. The expedition continued to explore the north coast of South America, until they realized they did not have enough men and sailed to Hispaniola, the island that is presently divided into the Dominican Republic and Haiti. With his share of the earnings from this campaign, Balboa settled in Hispaniola in 1502, where he resided for several years as a planter and pig farmer. However, he ended up in debt and finally was forced to abandon life on the island. In 1508, the king of Spain, Ferdinand II "The Catholic", commissioned the conquest of Tierra Firme (the area roughly corresponding to the Isthmus of Panama). He created two new territories in the region between El Cabo de la Vela (near the eastern border of Colombia) and El Cabo de Gracias a Dios (the border between Honduras and Nicaragua). The Gulf of Urabá became the border between the two territories: Nueva Andalucía to the east, governed by Alonso de Ojeda, and Veragua to the west, governed by Diego de Nicuesa. In 1509, wishing to escape his creditors in Santo Domingo, Balboa left the island as a stowaway, hiding inside a flour barrel together with his dog "Leoncico," in the expedition commanded by the Alcalde Mayor of Nueva Andalucía, Martín Fernández de Enciso, whose mission it was to aid Alonso de Ojeda, his superior. De Ojeda, together with seventy men, had founded the settlement of San Sebastián de Urabá in Nueva Andalucía, on the location where the city of Cartagena de Indias would later be built. However, the settlers encountered numerous warlike natives living in the area, who used poisoned weapons, and de Ojeda was injured in the leg. A short time later, de Ojeda sailed for Hispaniola, leaving the colony under the supervision of Francisco Pizarro, who, at that time, was only a soldier waiting for Enciso's expedition to arrive. De Ojeda asked Pizarro to leave some men in the settlement for 50 days and, if no help arrived at the end of that time, to use all possible means to get back to Hispaniola. Before the expedition arrived at San Sebastián de Urabá, de Enciso discovered Balboa aboard the ship, and threatened to leave him at the first uninhabited island they encountered; he later thought better of this and decided that Balboa's knowledge of that region, which he had explored eight years before, would be of great utility. This, in addition to the crew's pleas for his life, left de Enciso with no choice but to spare Balboa and keep him aboard. Moreover, both agreed on removing de Nicuesa as governor of Veragua. After the 50 days had passed, Pizarro started preparations for the return to Hispaniola, when Enciso's ship arrived. Balboa had gained popularity among the crew because of his charisma and his knowledge of the region. By contrast de Enciso was not well liked by the men: many disapproved of his order to return to San Sebastián, especially after discovering, once they had arrived, that the settlement had been completely destroyed and that the natives were already waiting for them, leading to a series of relentless attacks. Balboa suggested that the settlement of San Sebastián be moved to the region of Darién, to the west of the Gulf of Urabá, where the soil was more fertile and the natives less warlike. de Enciso gave serious consideration to this suggestion, and the regiment later went to Darién, where the native cacique (chieftain) Cémaco had 500 warriors waiting, ready for battle. The Spanish, fearful of the large number of enemy combatants, made a vow to the Virgen de la Antigua, venerated in Seville, that they would name a settlement in the region after her should they prevail. It was a difficult battle for both sides, but, by a stroke of luck, the Spanish came out victorious. Cémaco, together with his warriors, abandoned the town and headed for the jungle. The Spanish plundered the houses and gathered a treasure-trove of golden ornaments. Balboa kept his vow, and, in September 1510, founded the first permanent settlement on mainland American soil, and called it Santa María la Antigua del Darién. The victory of the Spanish over the natives and the founding of Santa María la Antigua del Darién, now located in a relatively calm region, earned Balboa authority and respect among his companions. They were increasingly hostile towards Alcalde Mayor de Enciso, whom they considered a greedy despot because of the restrictions he imposed on their appropriation of the natives' gold. Balboa took advantage of the situation, acting as the spokesman for the disgruntled settlers. He removed de Enciso from the position of alcalde mayor, using the following legal maneuver: de Enciso was now controlling an area in Veragua, to the west of the Gulf of Urabá; since he was substituting for Alonso de Ojeda, his mandate was illegitimate, because the governor of Veragua was Diego de Nicuesa, not de Ojeda; therefore, de Enciso should be deposed and arrested. After de Enciso's ouster, a more open government was established and a municipal council was elected, the first in the Americas. Two alcaldes were appointed: Martín Samudio and Vasco Núñez de Balboa. Shortly after this, a flotilla led by Rodrigo Enrique de Colmenares arrived in Santa María. The commander's objective was to find de Nicuesa, who was also facing some difficulties in the north of Panamá. When de Colmenares learned about the recent events, he convinced the town's settlers that they should submit to the authority of de Nicuesa, since their land was under his jurisdiction. de Colmenares invited two representatives, Diego de Albites and Diego del Corral, to be named by the local government, to travel with his flotilla and offer de Nicuesa authority over the city. De Colmenares found de Nicuesa near the town of Nombre de Dios, badly wounded and with few men remaining, on account of a skirmish with local natives. After his rescue, Governor de Nicuesa heard about Balboa's exploits, the chieftain Cémaco's bounty, and Santa María's prosperity. 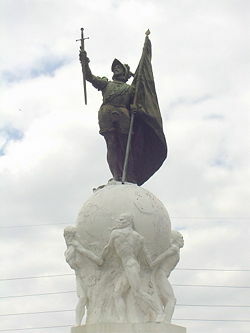 Regarded Balboa's actions as a challenge to his authority in Veragua, he vowed that he would punish Balboa as soon as he gained control of the city. A certain Lope de Olano, who was jailed together with other malcontents, persuaded Santa María's representatives that they would make a serious error in handing control over to de Nicuesa, whom he described as cruel, greedy, and able to singlehandedly destroy the city's prosperity. With this evidence, de Albites and del Corral fled to Darién ahead of de Nicuesa and informed Balboa and the municipal authorities of the governor's intentions. When de Nicuesa arrived at the city's port, a mob appeared, and the ensuing disturbance prevented the governor from disembarking into the city. De Nicuesa insisted on being received, no longer as governor, but as a simple soldier, but still the colonists did not allow him to disembark. He and 17 others were forced to board an unseaworthy boat with few supplies, and were put out to sea on March 1, 1511. The ship disappeared, leaving no trace of de Nicuesa and his men, and thus Balboa became governor of a settled and "pacified" territory of Veragua. With the title of governor came absolute authority in Santa María and all of Veragua. One of Balboa's first acts as governor was the trial of Fernández de Enciso, accused of usurping the governor's authority. De Enciso was sentenced to prison and his possessions were confiscated. However, he was to remain imprisoned only for a short time: Balboa set him free under the condition that he return immediately to Hispaniola and from there to Spain. With him on the same ship were two representatives from Balboa, who were to inform the colonial authorities of the situation, and request more men and supplies to continue the conquest of Veragua. In the meantime, Balboa, in the pattern of later conquistadors, set sail for the west, traveling along Panama's Caribbean coastline, defeating various tribes and befriending others, exploring rivers, mountains, and sickly swamps, while always searching for gold and slaves and enlarging his territory. He was also able to quell revolts among those of his men who challenged this authority, and, through force, diplomacy, and negotiation, he earned a certain respect and fear among the natives. In a letter addressed to the King of Spain, he expressed, somewhat ironically, that he had to act as a guide and even open roads by his own hand. He succeeded in planting corn, received fresh supplies from Hispaniola and Spain, and got his men used to life as explorers in the new territories. Balboa managed to collect a great deal of gold, much of it from the ornaments worn by the native women, and the rest obtained by violence. In 1513, he wrote a lengthy letter to the King, requesting more men (who were already acclimatized) from Hispaniola, weapons, supplies, carpenters versed in shipbuilding, and all the necessary materials for the building of a shipyard. 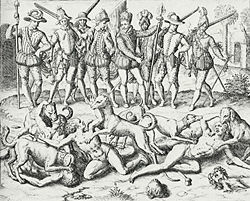 In a subsequent letter, from 1515, he would refer to his humanitarian policies regarding the natives, while at the same time recommending extreme severity in dealing with cannibals and violent tribes. At the end of 1512 and the first months of 1513, he arrived in a region dominated by the cacique Careta, whom he easily defeated and then befriended. Careta was baptized and became one of Balboa's chief allies; he ensured the survival of the settlers by promising to supply the Spaniards with food. Balboa then proceeded on his journey, arriving in the lands of Careta's neighbor and rival, cacique Ponca, who fled to the mountains with his people, leaving his village open to the plundering of the Spaniards and Careta's men. Days later, the expedition arrived in the lands of cacique Comagre, fertile but reportedly dangerous terrain. However, Balboa was received peacefully and even invited to a feast in his honor; Comagre, like Careta, was then baptized. It was in Comagre's lands that Balboa first heard of "the other sea." It started with a squabble among the Spaniards, unsatisfied by the meager amounts of gold they were being allotted. Comagre's eldest son, Panquiaco, angered by the Spaniards' avarice, knocked over the scales used to measure gold and exclaimed: "If you are so hungry for gold that you leave your lands to cause strife in those of others, I shall show you a province where you can quell this hunger." Panquiaco told them of a kingdom to the south, where people were so rich that they ate and drank from plates and goblets made of gold, but that the conquerors would need at least a thousand men to defeat the tribes living inland and those on the coast of "the other sea." The unexpected news of a new sea, with lands rich in gold, was received by Balboa with great interest. He returned to Santa María at the beginning of 1513 to recruit more men from Hispaniola. There that he learned that de Enciso had told the colonial authorities what had happened at Santa María. After seeing that there would be no assistance from Hispaniola, Balboa sent de Colmenares directly to Spain to look for help. While the expedition to the South Sea was being organized in Santa María, some explorers traveled up the Atrato River toward the interior, but came back empty-handed. Meanwhile, Balboa's request for men and supplies from Spain had been denied: Enciso's case was by then widely known in the Spanish court. Therefore, Balboa had no choice but to carry out his expedition with the few resources that he had on hand in Santa María. Using information given by various friendly caciques, Balboa started his journey across the Isthmus of Panama on September 1, 1513, together with 190 Spaniards, a few native guides, and a pack of dogs. Using a small brigantine and ten native canoes, they sailed along the coast and made landfall in cacique Careta's territory. On September 6, the expedition continued, now reinforced with one thousand of Careta's men, and entered cacique Ponca's land. Ponca had reorganized and attacked the expedition, but he was defeated and forced to ally himself with Balboa. After a few days, and with several of Ponca's men, the expedition entered dense jungle on September 20, and, with some difficulty, arrived four days later in the lands of cacique Torecha, who ruled in the village of Cuarecuá. In this village, a fierce battle took place, during which Torecha was defeated and killed. His followers decided to join the expedition. However, the main body was by then exhausted and several men were badly wounded, so many decided to stay in Cuarecuá. The few men that continued the journey with Balboa entered the mountain range along the Chucunaque River the next day. According to information from the natives, the South Sea could be seen from the summit of this range. Balboa went ahead and, before noon that day, September 25, he reached the summit and saw, far away in the horizon, the waters of the undiscovered sea. The emotions were such that the others eagerly joined in to show their joy at Balboa's discovery. Andrés de Vera, the expedition's chaplain, intoned the Te Deum, while the men erected stone pyramids, and engraved crosses on the barks of trees with their swords, to mark the place where the discovery of the South Sea was made. 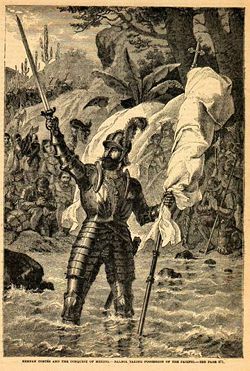 After the epic moment of discovery, the expedition descended from the mountain range towards the sea, arriving in the lands of cacique Chiapes, who was defeated after a brief battle and invited to join the expedition. From Chiapes' land, three groups departed in the search for routes to the coast. The group headed by Alonso Martín reached the shoreline two days later. They took a canoe for a short reconnaissance trip, thus becoming the first Europeans to navigate the Pacific Ocean. Back in Chiapes' domain, Martín informed Balboa, who, with 26 men, marched towards the coast. Once there, Balboa raised his hands, his sword in one and a standard with the image of the Virgin Mary in the other, walked knee-deep into the ocean, and claimed possession of the new sea and all adjoining lands in the name of the Spanish sovereigns. After traveling more than 110 kilometers, Balboa named the bay where they ended up San Miguel, because they arrived on September 29, the feast day of the archangel Michael. He named the new sea Mar del Sur, since they had traveled south to reach it. This event is considered by many historians to be the second most important discovery of the Spanish conquista, after Columbus' discovery of the Americas in 1492. Balboa's main purpose in the expedition was the search for the gold-rich kingdoms promised by Panquiaco. To this end, he crossed through the lands of caciques Coquera and Tumaco, defeating them easily and taking their riches of gold and pearls. He then learned that pearls were abundant in the islands ruled by Terarequí, a powerful and feared cacique. Balboa set out in several canoes towards these islands, even though it was the beginning of October and the weather conditions were not favorable. He was barely able to make out the islands, and named the largest one Isla Rica (Rich Island, today known as Isla del Rey). He named the entire group Archipiélago de las Perlas, which they are still called today. In November, Balboa decided to return to Santa María but by a different route in order to further expand his territory and procure more gold. He passed through the regions of Teoca, Pacra, Bugue Bugue, Bononaima, and Chorizo, defeating some by force and befriending others through diplomacy. A particularly bloody battle took place against the cacique Tubanamá, whom Balboa eventually defeated. In December, the expedition arrived back in the Caribbean coast, by the Gulf of San Blas, a strip of land ruled by cacique Pocorosa. From there, he headed to the lands of Comagre, to find that his elderly ally had died. His son, Panquiaco, was now the new chieftain. From there, he crossed the lands of Ponca and Careta, to finally arrive in Santa María on January 19, 1514, with a treasure in cotton goods, and a fortune in gold and pearls. All this, however, did not compare to the magnitude of the discovery of the South Sea on behalf of Spain. Balboa commanded Pedro de Arbolancha to set sail for Spain with news of this discovery, bringing as well the one-fifth portion of the treasure to the king, as the law required. The accusations of Fernández de Enciso, whom Balboa had deposed, and the removal and disappearance of Governor de Ojeda, forced the king to name Pedro Arias de Ávila as governor of the newly created province of Castilla de Oro. Arias, better known as Pedrarias Dávila and who would later become notorious for his cruelty, took control of Veragua and managed to calm the situation. Pedrarias arrived from Arbolancha, Spain with an expedition of 1,500 men and 17 ships, thereby ensuring that Balboa's requests to the crown for more men and supplies were met. This would be to that date the largest and most complete expedition to leave Spain for the New World. 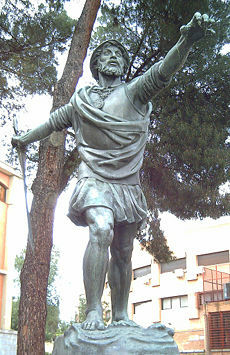 Statue of Balboa in Madrid (E. Pérez, 1954). Pedrarias was accompanied on this expedition by Gaspar de Espinosa, who held the office of alcalde mayor; the very same Martín Fernández de Enciso whom Balboa had forced into exile, now Chief Constable (Alguacil Mayor) ; the royal officer and chronicler Gonzalo Fernández de Oviedo; as well as several captains, among them Juan de Ayora, Pedrarias' lieutenant. There were also several clerics, most notably the Franciscan friar Juan de Quevedo, appointed bishop of Santa María. There were also women among the travelers, among them Isabel de Bobadilla, Pedrarias' wife. More than 500 men died from starvation or due to the inclemencies of the weather soon after reaching Darién. 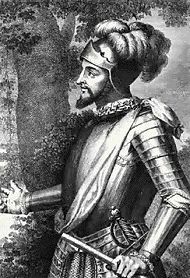 Fernández de Oviedo was to note that knights covered in silk and brocade, who distinguished themselves valiantly in the Italian Wars, would die, consumed by hunger and fever, due to the nature of the tropical jungle. Balboa received Pedrarias and his representatives in July 1514 and accepted with dignity his replacement as governor and mayor. The settlers, however, did not like the change and some were planning to take up arms against Pedrarias, even as Balboa showed respect to the new colonial authorities. As soon as Pedrarias took charge, de Espinosa had Balboa arrested and tried, sentencing him to pay reparations to de Enciso and others. He was, however, found innocent of the charge of murdering de Nicuesa, so he was freed shortly afterward. Due to overpopulation in Santa María, Pedrarias called on several expeditionaries to search for new locations fit for settlement. Balboa requested of Pedrarias that he be allowed to explore the Dabaibe region, along the Atrato river, for there was a rumor of the existence of a temple filled with vast riches there. However, this expedition turned out to be a failure, leaving Balboa wounded in attacks by the region's natives. This setback, however, did not deter Balboa's ambitions of returning to explore the South Sea. Secretly, he arranged to recruit a contingent of men from Cuba. The ship carrying them berthed just outside Santa María, and its caretaker informed Balboa of their arrival, receiving in return 70 gold castellanos. Pedrarias, however, soon found out about the ship; furious, he had Balboa arrested, took away all his men, and intended to lock him up in a wooden cage. He was restrained by Bishop de Quevedo, however, who appealed to him not to abuse his power on Balboa. Luckily for Balboa, around that time the Spanish Crown would finally recognize his valuable services. The king bestowed on him the titles of "Adelantado of the South Seas" and "Gobernador of Panama and Coiba." On top of this, the King instructed Pedrarias to show Balboa the greatest respect and to consult him on all matters pertaining the conquest and government of Castilla de Oro. Pedrarias was further to release and exonerate Balboa, lifting all charges brought up against him in the matter of the clandestine recruitment of an expeditionary party. At that point, rivalry between Balboa and Pedrarias ceased abruptly, due in large part to the intercession of Bishop de Quevedo and Isabel de Bobadilla, who arranged for Balboa's marriage to María de Peñalosa, one of Pedrarias' daughters, who was in Spain. The marriage took place, and shortly thereafter, the bishop left for Spain. The friendship between Pedrarias and Balboa lasted barely two years, but in that time Balboa came to show great filial affection toward his father-in-law. Balboa wished to continue exploring the South Sea, but Pedrarias did everything possible to delay his departure. However, in light of the new relationship between them, Pedrarias could not stop him indefinitely, and he finally consented to let Balboa go on his new expedition, giving him license to explore for a year and a half. Between 1517 and 1518, Balboa moved to Acla with 300 men and, using the manpower of the natives and African slaves, gathered the materials necessary to build new ships. He traveled up to the Balsas river, where he had four ships built. He travelled 74 kilometers (46 miles) through the Pacific, surrounding the Pearl Islands and the coasts of Darién, up to Puerto Piñas, so named because of the large amounts of pineapples (piñas) he found there. He then returned to Acla, to continue the construction of sturdier ships. However, on his return, Pedrarias wrote warm letters urging Balboa to meet him as soon as possible. Balboa quickly obeyed. Halfway to Santa María, he encountered a group of soldiers commanded by Francisco Pizarro, who arrested him in the name of the governor and accused him of trying to usurp Pedrarias' power and create a separate government on the South Sea. Outraged, Balboa denied all charges and demanded that he be taken to Spain to stand trial; Pedrarias, however, together with Martin Enciso, ordered that the trial take place without delay. Balboa's trial began in January 1519, and on the fifteenth of that month, de Espinosa sentenced him to death by decapitation. Four of Balboa's friends, Fernando de Argüello, Luis Botello, Hernán Muñoz, and Andrés Valderrábano, accused as accomplices, were sentenced to the same fate. The sentence was to be carried out in Acla, to show that the conspiracy had its roots in that colony. As Balboa and his friends were being led to the block, the town crier announced: "This is the justice that the King and his lieutenant Pedro Arias de Ávila impose upon these men, traitors and usurpers of the Crown's territories." Balboa could not restrain his indignation and replied: "Lies, lies! Never have such crimes held a place in my heart, I have always loyally served the King, with no thought in my mind but to increase his dominions." Pedrarias observed the execution, hidden behind a platform. The executioner beheaded Balboa and his four friends with an axe. Balboa's head did not come off clean on the first try; it took three. Their heads remained in public display for several days, as a sign of Pedrarias' might. The final location of Balboa's remains is unknown, partly because there is no record of what happened in Acla after the execution. Thus, it was Gaspar de Espinosa, Pedrarias' underling, who sailed the South Sea aboard the very ships that Balboa had commissioned. In 1520, Ferdinand Magellan renamed the sea the Pacific Ocean because of the calm waters he arrived in after navigating the stormy Straits of Magellan. Balboa's discovery of the Pacific was celebrated by his compatriots and is still acknowledged as among the most consequential discoveries of the Age of Exploration. Balboa's explorations of the region establishment of the first European settlement on the American mainland Balboa effectively inaugurated an era of colonization that would displace native peoples and cultures, first by the Spanish and later by the Portuguese, English, French, and Dutch. Ruthless conquest in pursuit of riches and the introduction of virulent diseases for which native Americans had no immunity would bring about the near-complete eradication of indigenous American culture. Racism and the desire to control lucrative local resources fueled the gross mistreatment of the indigenous inhabitants. Although Balboa suffered a premature death, his actions and deeds are remembered by history. Several parks and avenues throughout Panama bear the name "Vasco Núñez de Balboa," and a number of monuments honor his discovery of the Pacific. The Panamanian currency is called the Balboa, and his likeness appears on the obverse of some coins. His name is also attached to Panama City's main port, Balboa (the Pacific entrance to the Panama Canal) and the Balboa District within Panamá Province to which the Pearl Islands that he discovered belong. In San Francisco, California, USA, Balboa's name appears among a row of avenues which are named after Spanish conquistadors. There are large public parks in both San Francisco and downtown San Diego, California named after Balboa. Balboa's name is also honored in Madrid with a street and an underground metro station. The highest order granted by the Panamanian government to distinguished and outstanding figures, foreign and domestic, is the Orden Vasco Núñez de Balboa, in various degrees, as established by Law 27 from January 28, 1933. The lunar crater and a crater on Mars, are named Balboa. ↑ Clarence Henry Haring. The Spanish Empire in America. (New York, NY: Harcourt, Brace & World, 1947), 259. ↑ Joy Hakim. The First Americans Prehistory-1600, Vol. 1, A History of US. (New York, NY: Oxford University Press, 2002), 86. ↑ Alcalde Mayor: may be translated as mayor or chief judge—a position combining judicial, military, civil, and police powers, that may or may not be held by a person with legal training. ↑ Smith Burnham. Our Beginnings in Europe and America: How Civilization Grew in the Old World and Came to the New. (Philadelphia, PA: John C. Winston Company, 1918), 233. ↑ Goodrich and Howland, 1873, 223. Asenjo García, Frutos. 1991. Vasco Núñez de Balboa: El descubrimiento del Mar del Sur. Madrid, ES: Sílex Ediciones. ISBN 8477370346. Burnham, Smith. 1918. Our Beginnings in Europe and America: How Civilization Grew in the Old World and Came to the New. Philadelphia, PA: John C. Winston Company. de Anagoya, Pascual. 1829. Relación de los sucesos de Pedrarias Dávila, Vol. 3. Madrid, ES. Encyclopedia Ilustrada Cumbre - Tomo 10, 32nd edition - 1993. Editorial Hachette Latinoamérica, S.A. de C.V., México. ISBN 970-611-125-5. pages 186-188. Fernández de Oviedo y Valdés, Gonzalo. 1850. Historia general y natural de las Indias. Madrid, ES: Impr. de la Real academia de la historia. Garrison, Omar V. 1977. Balboa el conquistador: La odisea de Vasco Núñez, descubridor del Pacífico. Barcelona, ES: Editorial Grijalbo. ISBN 8425307481. Goodrich, Frank B., and Edward Howland. 1873. Ocean's Story: Or, Triumphs of Thirty Centuries. Philadelphia, PA; Boston, MA; Cincinnati, OH: Hubbard bros.
Hakim, Joy. 2002. The First Americans Prehistory-1600, Vol. 1, A History of US. New York, NY: Oxford University Press. ISBN 0195153197. Haring, Clarence Henry. 1947. The Spanish Empire in America. New York, NY: Harcourt, Brace & World. López de Gómara, Francisco. 1553, 1555. Historia General de las Indias. Medina del Campo, ES; Zaragoza, ES. Retrieved August 24, 2008. Sosa, Juan B. and Enrique J. Arce. 1911. Compendio de Historia de Panamá. Panamá. 14:156 - 171. Retrieved August 24, 2008. Vasco Núñez de Balboa. Discoverers Web. Retrieved August 24, 2008. Woodward, Ralph Lee. 1999. Central America: A Nation Divided. New York, NY: Oxford University Press. ISBN 0195083768. This article draws heavily on the corresponding article in the Spanish-language Wikipedia, which was accessed in the version of 14 April 2006. It was translated by the Spanish Translation of the Week collaboration. History of "Vasco Núñez de Balboa"
This page was last modified on 15 January 2016, at 17:44.